I know there are plenty of people for whom talk of interconnects, speaker cables, and power cords is a bunch of hooey. Well, they should give the folks at Astoria Studio in London a call. That's where David Gilmore of Pink Floyd fame does his thing. Or they can give Doug Sax and James Guthrie a call -- when they're done re-mastering Pink Floyd's Dark Side of the Moon for SACD, that is. If they are still not satisfied, they can try the Crest National SACD replication plant. You see, they all use Shunyata Research products, as do high-end manufacturers such as Halcro, Balanced Audio Technology, Jeff Rowland Design Group, Audio Research, and Pass Labs -- just to name a few. They've all probably heard what I heard, and now there's no going back. Shunyata Research came into being as the result of Caelin Gabriel's 15 years as the leading researcher for the National Security Agency, or NSA for short. Working in the field of low-level signal emissions, Gabriel developed equipment designed to extract and decode the most minute transmitted signal. With the elimination of electronic noise as an essential goal in this endeavor, Gabriel's skill set is a perfect fit for the field of high-end audio wire. For reviewers, it is all too easy to sing the praises of the latest entry into the high-end wire game. I have become rather blasé when confronted by the prices of some of the mainstream manufacturers mega-cables and power cords. But the Aries interconnect makes this an exiting opportunity to spread the word -- for two very important reasons. First, the Aries is the jewel of the Shunyata Constellation series, not an easy achievement in such an accomplished repertoire, and it is also one of the finest interconnects I have ever used. Second, at $650 per meter pair, the Aries is one hell of a great deal. Before I get to the nitty-gritty, let me introduce the rest of the players. At $1250 for an eight-foot pair, the Lyra speaker cable delivers well beyond what its price may suggest, if not to the revolutionary extent of the price:performance ratio that the Aries interconnect delivers. The Phoenix speaker cable, $1995 per eight-foot pair, resides above the Lyra, and topping off the Constellation series is the Andromeda speaker cable at $2995 per eight-foot pair. Technically speaking, the Shunyata speaker cables represent a serious leap in geometry sophistication. Dubbed Matrix, this geometry consists of two counter-rotating spirals that are interlocked at the center point. Each spiral is composed of three, four, or six individual wires (depending upon the cable model). The spirals wind counter to one another to cancel common-mode interference patterns. 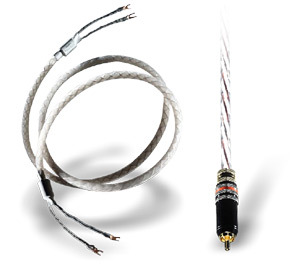 The individual wire strands are widely spaced and cross at approximately 90-degree angles to eliminate cable capacitance. The open design with multiple smaller wires reduces self-inductance compared to conventional construction of equivalent wire gauge. Matrix is the most complex braided geometry that I am aware of. Each cable must be braided by hand to length. In other words, if you need a ten-foot cable, it must be braided specially to that length. Obviously, those who braid the cable are very talented and have months of training. The Aries interconnect is based upon three conductors that are of litz construction. There are more than 600 individually insulated fine strands of wire. The wires are wound around a hollow core to reduce inductance and are separated by isolation rods to reduce capacitance. The clear jacket material was chosen to reduce distortions caused by the carbon-based coloring agents in conventional insulation. Shunyata's Anaconda power cords came to market in January of 2002. Riding the wave of buzz created by the King Cobra v2 power cord and the Hydra power distributor, the Anaconda quickly became an audio insider's favorite in the upper echelons of the power-cord hierarchy. There are currently two versions of the Anaconda: the standard Anaconda vX, which works best with digital and video components, and the Anaconda Alpha designed for use with high-power amplifiers and analog preamps. Both cost $1995 per six-foot cord. The results with the Aries interconnect and Lyra speaker wire came hand in hand with the inclusion of the Anaconda power cords and the $2495 Hydra power distributor. It would be too simplistic to just give a blanket recommendation to these products, so I will give you an idea of what to expect from the parts as well as the whole. I replaced the ESP Essence power cords on the Linn Sondek CD12, the Jeff Rowland Coherence II preamp, and the Pass Labs X600 monoblocks with the Anacondas. It has been three or four years since I had replaced the power cords in my system, so I had a pretty good measure of my system's balance with the ESP cords going into the review. I chose to replace all the cords at once rather than in piecemeal fashion. I just find mixing and matching brands inherently confuses the observations and can lead to erroneous conclusions. In conjunction with the Hydra power distributor, the inclusion of the Anaconda power cords left me with the sinking feeling that I would not be going back to my old standbys anytime soon. The change in the system's qualitative balance was greater than the sheer quantitative gain, however. Everything I liked about the sound, particularly with the Aries in the system, became more readily available, while problems I hadn't realized were there to the extent they actually were had been reduced significantly. The soundstage gained a new level of depth and clarity. Inner detail from the top of the treble down through the lower registers imparted so much more information to absorb -- and be absorbed by. And the bass grip, that rubber-to-the-road sensation that is provided by clean, low-bass transients followed by dynamic punch, became more part of the main attraction rather than a bit player. I've had the unnerving experience more than once when an "improvement" has been made to the system by adding a much-anticipated product that, while my head would register the improvement, my heart would be left craving something that had been there previously. This "throwing the baby out with the bath water" syndrome should always be carefully monitored. Gratefully, the baby in this case, a level of musical enjoyment and involvement, was bathed, powdered dry, and fattened up with Farina. While it's true that an improvement can often expose a flaw in the system that had previously been masked, the inclusion of $2000 power cords and even more expensive power distributors should not be sought as a cure for the shortcomings of poorly matched or inferior components. Make sure you have the right combo of components, and then get to work on the power issue. To put a bow on it, when you add in the Shunyata power products, what you can expect is less AC noise and grunge that grays-out background silence and homogenizes instrumental timbre. The level of dynamic contrasts both large in scale and subtle along with the rendering of detail will be much improved, and instrumental texture will hit home with a more organic feel. The level of both the intellectual and emotional connection to the music will be greatly enhanced. When compared directly to the ESP power cords, the Anaconda maintains the warmth that makes the ESP cords so welcome while piling on a heap of added transparency, dynamic life, and frequency extension. My source is the Linn Sondek CD12 CD player. Preamp duties were split between the Jeff Rowland Coherence II and Pass Labs X2.5. Amplifier duties were split three ways among the Pass Labs X600 monoblocks, Krell FPB-700cx stereo amp, and Jeff Rowland Model 302 stereo amplifier. Avalon Radian, Talon Audio Khorus X, and Sonus Faber Amati Homage served as speakers. Power distribution was provided by both a Cinepro Power Pro 30 power conditioner and a Shunyata Research Hydra. Just to put my experience with cables into a little perspective, I have owned or used wire from MIT, Transparent Audio, Cardas, Monster, and XLO. Of those, MIT's Oracle V2 line has found a permanent home in my system for the last two and a half years. MIT Oracle is one of the most accomplished designs around, and if you can afford the price of admission, you will not regret your choice. I began the review by inserting the Aries interconnects and the Lyra speaker cables into the system in place of the MIT cables. I was not confronted with the expected let down one would anticipate from a product roughly one-ninth the cost of my reference. Quite to the contrary, and to my shock, the Aries/Lyra combo held its own -- and then some. There's a directness to the sound of the Shunyata combo that is riveting. Backed by a background that strikes me as close to total silence, sonic imagery simply pops into focus. The soundstage is something to behold -- wall to wall, the room fills with images like those presented on "Willow Weep For Me" from Duke Ellington's Indigos [Columbia CK-4444]. The spread of horns along the back of the stage creates a very strong illusion of the real thing. The air between and around the instruments was charged with energy, bringing the acoustic to life in a way that cables that smear minute details or lose low-level focus couldn't muster. Disc after disc confirmed that the Aries in particular was taking the state of the art in wire design closer to the ideal of no wire at all. Other areas that really separate the best from the rest are how a wire renders tonal balance and timbre, and how well it can convey dynamic shading. Nearly every cable I have used has in one way or another altered one or all of these critical areas. In the case of the MIT Oracle V2, these areas are left relatively unscathed. Music breathes naturally, and high-level dynamics neither compress nor constrict the bloom of the instruments' natural timbre. Here the Aries once again proves to be hot on the heels of the MIT. Dynamics seem to flow and breathe naturally. Used in conjunction with the Pass Labs X2.5 preamp and the new Jeff Rowland 302 stereo amp, the Shunyata cables portrayed some of the best dynamic contrasts I have ever heard outside a live performance. Subtle shifts in volume are rendered with grace, particularly in the treble where cymbals just shimmer with life. These interconnects and speaker cables should never be accused of being boring or rolled-off. Reaching for Tommy Flannigan's Sea Changes [Evidence 22191], I found the brushes on the snare and the blows landed upon the cymbals to possess complexity and action. Once again, there seems to be very little getting in the way of the signal's integrity. Assuming you can clear the financial hurdle, if only a portion at a time, and your components are up to snuff, I suggest starting off with the Aries interconnects and the Lyra speaker cables -- even though Shunyata has pricier speaker cables. This combo will likely yield the greatest overall improvement. Even if you are using state-of-the-art wire, you may well find the Aries and Lyra more to your liking. Breaking it down even further, compared to the Aries interconnect, the Lyra speaker cables seem to have a slight subtractive coloration, perhaps favoring speed and transparency to heft and tonal weight. This was true when -- unfairly, mind you -- I compared the Lyra to the seven-times-the-price MIT Oracle V2. There have never been so many choices confronting the audiophile. With every aspect of the high-end system being addressed, companies like Shunyata Research are finding ways of advancing and expanding the state of the art in high-end home audio. Those who have achieved a comfortable level of satisfaction with their systems can now find a large measure of improvement with the inclusion of the Shunyata product line without the worry of throwing off the hard-fought, delicate system balance that yields the sonic magic. For the price of entry, the Aries interconnects and Lyra speaker cables offer an enormous amount of performance. The Aries, in particular, is flat-out awesome. The Lyra proved to be better suited to systems that need just a touch of speed and delineation. For instance, using the Lyra with the Sonus Faber Amati Homage, which is rather lush, proved to be a perfect match. The level of refinement both in terms of transparency and accuracy of timbre, as well as the dynamic dexterity provided by the Shunyata lineup made the act of listening to music more of an event that I participated in rather than the passive, rather static relationship with the music that is often passed off as involvement. With the addition of the Shunyata products, my system truly became music to my ears. Prices: Aries interconnects, $650 USD per meter pair; Lyra speaker cables, $1250 per eight-foot pair.